The Medicanimal travel bowl is an ideal accessory for walks, it’s light, portable and makes post walkies refreshment for your dog easy! Suitable for both food and water, it can be easily folded up and stored in its pocket when not in use. 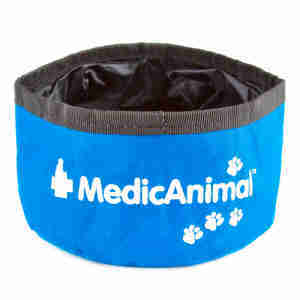 The Medicanimal travel bowl also features an integrated hang loop to clip to your back pack or to hang out to dry. Also suitable for cats too!